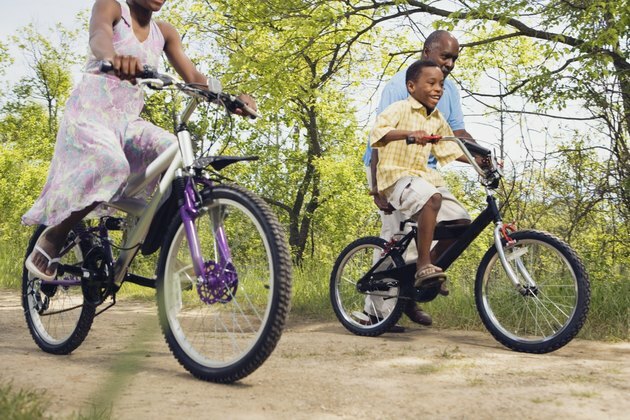 Common causes of squeaky bicycle breaks include brake pads that need cleaning, a dirty bike rim brake surface or brake pads that strike the rim evenly across the surface or with the rear part of the brake first. Brakes that are "toed in" are most effective. This means the front end of the brake pad is positioned at a slight angle so the front portion of the brake pad touches the rim first when you apply the brakes. Loosen the brakes either by using the quick release or by lifting the cable from its cradle on the top of the brake. The technique you use depends on the type of your bike's brakes. Remove the pads from the brakes with a 5-mm Allen wrench. Loosen the bolt at the back of the brake pad shoe. Clean the surface of the brake pad with a clean cloth and rubbing alcohol. Clean the rim in the same manner, focusing on the site at which the rim comes in contact with the brake. Replace the brake pads so that the come in contact with the rim when you apply the brakes. Close the brake quick-release or reattach the cable to its anchor. Check the angle of the brake pads if you have dual-pivot brakes, like those on road bikes. The front of the brake pad shoud sit at a slight angle toward the rim surface. If it does not, locate the angle screw at the top of the body of the brake. Use the proper size Allen wrench to loosen the screw and adjust the brake pads so they point in toward the rim surface slightly at the front end. Tighten the screw again. Test the brakes by applying them lightly. Only the front of the brake pad should touch the rim. Then apply the brakes with full force. The entire brake pad should be in contact with the rim.